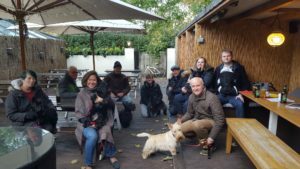 Welcome to the very first blog from the London Scottie Club! Over the coming weeks and months, we look forward to engaging with all of our members and others curious about Scottish Terriers, and jotting down lots of goodies in the form of text blogs. We will also conduct interviews with special guests, professionals and celebrities, in the form of podcasts, audio content you can listen to “on demand” any time you like, including when you are walking your dog! And although all of our pets are pedigree, there is one little cross-bred that’s sneaked onto the website. It’s where text online meets audio. So, we will provide blogs in an audio format as well, so that if you catch us on portable devices like smartphones, allowing you listen while you walk your Scotties. We call it “Blog On The Go”. In fact, this is the very first Blog On The Go! And we hope you like the innovation. We want Scottie owners to be as active as they can so that they and their cherished Scotties lead a healthy life. The fact you have sought out and found our website, unless it was thanks to the accidental “fat finger” means that you are at least curious about Scotties. Or maybe like our members, you are dotty about Scotties! There is a fun element to the London Scottie Club, launched in March 2016. We are a social meet up group for Scotties and their owners within the M25 area. Some people have already asked whether they can join even though they are just outside the M25? The answer is yes. We are not rigid about this. But the M25 orbital motorway does kind of offer a focal border. It is not strictly imposed. If logistics allow you to come from beyond London – even from the ancestral home of the Scottish Terrier in Aberdeen – we would be honoured to welcome you, not shut the door on you! Our main admission requirements are that you have or intend to have or have previously had a Scottish Terrier as a pet. We seek to mix with friends who know the breed of dog, or if they are seeking to acquire a Scottie, they understand what they are letting themselves in for! We are essentially building a community of like-minded people. How much or how little you put into that process will reflect in what you get out of it too. We encourage you to become actively involved if you possibly can. But we will never turn away people who love Scotties. They are one of the most characterful of terriers that you will meet. Yes, they have Scotitude! They have been the pet of choice of British monarchs, US heads of state, as well as famous authors, actors and sport personalities. The idea of the club was borne out of both the excitement at a resurgence of the breed and a horror at people opting to have Scotties just because of a fad. We know Scotties were popular in Victorian Britain but reached their heyday in the 1920s and 1930s. They remained popular enough in the 1950s that the makers of the Monopoly game board decided to create a silver token in the shape of a Scottie. In a recent cull of tokens, the public was asked to vote on what they wanted off the board. The Scottie was the most popular token to remain - the vast majority of people demanded it stays. And so it has. But for all that, in the real world Scotties have been in decline for decades. Not on the endangered species list at the Kennel Club of Great Britain – they still number at least 40 each year in the heats at the Crufts show dog competition – they nevertheless are less in abundance than they once were. In a future blog we will examine why they have been in decline. But a funny thing has happened in the past few years. A surge – or maybe flash in the pan – in popularity of the proud Scottie. I asked the breeder from where my two Scottie pups Pikush and Pudding came how certain events had impacted on her business. She told me that normally she has a waiting list of around six people for Scotties. That pretty much clears up one litter. But following the 2014 Commonwealth Games in Glasgow, where Scotties were engaged in marching with the flagbearers at the opening ceremony, demand rocketed about six-fold to 36. Not bad. What about after Moscow’s Scottie Knopa won Crufts in 2015 – the first Scottie since 1929? Demand again rocketed about five-fold to 150. There I was thinking I rarely ever see a Scottie around in London, but maybe this will change in a few years. But is it even a good thing? If people want to have a Scottie as a kind of “trophy” dog now that one has finally won at Crufts? The London Scottie Club was launched partly in order to connect with others who have Scotties lurking around their homes, and partly to ensure that those who do lurk are getting the best treatment. From what I have seen so far, there are a lot of dedicated loving owners for Scotties out there. Hurrah! But as Scottie owners know, these dogs can also be a handful. I think it is fair to say that we would all rather there were fewer but happy Scotties around than a lot of unhappy ones. Sometimes owners are well-intentioned but misguided about the needs of their dogs. Again, so far all looks good in the London Scottie Club’s membership on that score! But should anyone need help, we want to ensure that help is at hand. And what makes us think we know what we are talking about? Nothing! We are not experts. We are not professionals. But what the club can do – through strength in numbers – is first of all exchange knowledge and experiences of fellow members, and secondly, invite top experts to visit us and offer talks about keeping Scotties. Hopefully, all of it in a friendly and welcoming way! So we look forward to seeing you get involved. Spread the word! Via social media, or your friends and neighbours. We look forward to seeing you at our events soon.